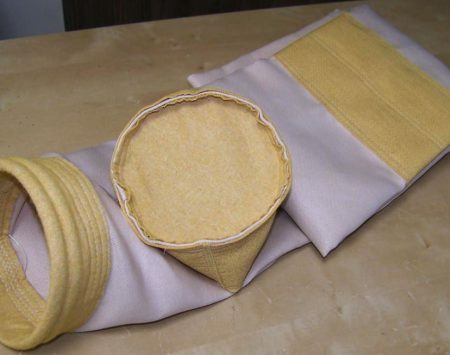 Glass (GL, fabric or needle felt) is used for manufacturing filter bags that are in constant contact with high temperatures. Glass fabrics or glass needle felts work successfully in a continuous temperature of up to 260°C (temperature peaks even up to 280° ). The advantage of this material is its very competitive price compared to needle felts with similar properties. This does not mean that it can always be an alternative to materials such as PPS, Polyimide or PTFE. 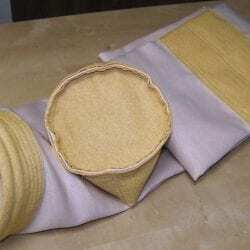 For the filtration with this material to be effective, some steps are necessary to improve its properties. For glass fabrics the surface lamination with a PTFE membrane is used. The warp and weft of the glass fabric become the carrier for the microporous PTFE membrane which stops the smallest particles of dust. Additionally, the weave of the fabric must be very dense since the stability of the structure has an impact on the service life of the filter bags made thereof. Dense fabric results in a high weight of the material which, in conjunction with the PTFE membrane, restricts the air permeability, resulting in a high resistance to filtration. In order for the filtration process to take place without obstacles, the filter ratio should be reduced. This material is very sensitive to mechanical damage: scratches, bending, friction, contact with sharp objects, corrosion, or even the smallest defects of the supporting cages. Glass fabric is described as fragile or brittle, which is why its use requires an appropriate support (special supporting cages made of suitable steel). A novelty are needle felt mixtures of glass and polymer fibers – still relatively unknown in Europe, but very popular in Asia.